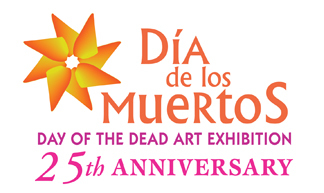 For years, the Día de los Muertos exhibitions at the Bath House have showcased works of art that cover a diverse gamut of artistic expressions, ranging from very serious and solemn subject matter to more joyful and celebratory themes. Our Advise for this Year: MAKE THE ART FESTIVE! After all, this year marks the 25th anniversary of this popular show. It is time to celebrate, indeed! To download a complete exhibition prospectus, please visit the Bath House Cultural Center’s online News Center at http://www.dallasculture.org/bathHouseCultureCenter/pressRelease.asp (pdf documents are dated 08/12/2011).